The entire article is worth a read, but please consider a snip on the law of diminishing returns of credit expansion and the accompanying increase in economic volatility. .... Here’s the question that may indeed morph into an investment theme for 2010 and beyond that we’d like to pose. Looking ahead, will the US economy be more or less volatile than we have experienced over what is close to the last thirty years? Yes or no? Economic rate of change highs and lows from the fifties through the seventies was a lot broader than has been the case subsequent. We often hear a lot of folks explain this away as the US transforming itself from an industrial to a service based economy. Less manufacturing dependence has meant less overall economic volatility, etc. We've transferred the cyclical inventory and manufacturing swings offshore, right? But is that really the case? Is it really just a function of domestic economic evolution, or is there something else going on here that ties right back into the keynote issue of the current economic and financial market cycle - credit? 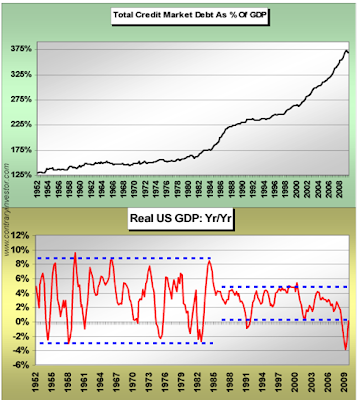 Longer term this question of the linkage of the credit cycle to the character, texture and rhythm (volatility) of GDP looms very large as we see it. We have one final table of data for your consideration. As you review the decade by decade trends in the numbers, remember the shape and decade by decade acceleration in the macro US credit cycle we lived through over the last half century. Have a look. Question - did we experience zero job growth in the last decade due to the nature of the US being a service economy? Did we simply stop creating service industry jobs? Or has it been the credit implosion and now lack of private sector credit creation that has engendered the drop in final demand and the coincident and necessary corporate cost cutting primary expressed in employment stats? Was the implosion in jobs in the 1930’s the result of the US “transforming” itself from an agrarian economy to one driven by industrialization? Or was it the aftermath credit bust environment subsequent to the prior 1920’s credit cycle of significance that blew apart the labor market? You get the picture and the concept. By the way, you already know manufacturing jobs imploded in the last decade as the government and service sector were the job creators, and that's not saying much at all as per the numbers. The last decade was certainly the worst for household net worth growth over the last six decades. Why? Because we are a service economy? Or because the credit bust engendered asset deflation of generational proportion on household balance sheets, essentially helping to drive much greater volatility in the rate of change of real US GDP? 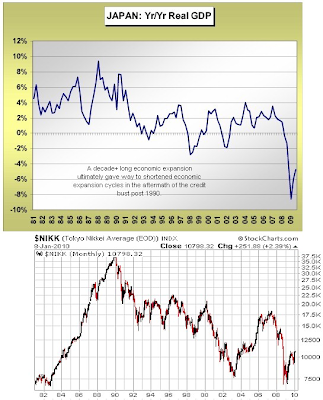 Did the credit bust primarily influence S&P equity price outcomes, or was it the fact that the character of the service economy drove a worse than lost decade experience for equities? Without trying to reach for melodrama, the table above sure speaks to the secular change engendered by changing credit cycle dynamics and seems to have little to nothing to do with the fact that the US is a service economy. This is why we believe that in the absence of a renewed and reinvigorated credit cycle domestically, history suggests economic cycles will become not only shorter in duration, but also more volatile in amplitude. Does that suggest the risk premium theoretically priced into financial assets at any point in time should increase or decrease from here? That's the issue. Tying in to what we discussed above, let's have a very quick look at the credit bubble and post bubble periods in Japan. Below is the year over year rate of change GDP trend for Japan from 1980 through to the third quarter of last year. We started the numbers in 1980 and the fact is that from '80 to early 1992, Japan experienced quite the elongated economic growth cycle. Very much as was the case in the US during the 1980's. But once the credit and asset bubbles (financial and real estate) popped in Japan in the early 1990's, the elongated economic expansions were no more. Economic volatility increased as is plainly visible in the chart below. It’s clear that US government officials have done a darn good job of talking up the economic recovery as of late. In many cases a better job than the carnival barkers on the Street. But will the markets allow the government to borrow and Fed to continue to print for years to come, all in the spirit of maintaining stimulus, while simultaneously these folks are talking up economic healing? Japan and the US are two different economies, social systems, etc. They just happen to have one thing in common, though. Human beings are making the key decisions that will influence economic and financial market outcomes. And of course the US has the same crew aboard who "never saw it coming" in the first place. No worries as we're sure their "vision" has been subsequently corrected to 20/20, hasn't it? Prepare for shorter US economic expansion cycles characterized by heightened volatility in the absence of another maniacal credit cycle. That seems to be the clear message of history speaking quite loudly. There are more charts and text in the article that are well worth a look. Thanks Brian.